2 Bedroom 1 Bathroom with full kitchen located in historic downtown anchorage. There is a fully stocked kitchen with a stove/oven, refrigerator, microwave, coffee maker and dishwasher. Cable Television, blue ray DVD player and free WIFi are included. Both upstairs and downstairs bedrooms have queen beds. The downstairs bedroom shares its space with the washer and dryer. There is a private parking spot right in front of the cottage. Additional parking is available on the streets nearby. The cottage is extreamly close to many restaurants, bars, coffee shops and stores. if you don't want to rent a car but still want to explore other areas of the city, and beyond, there is a bus stop just steps from your front door. I came to Alaska in 1978 to work at a sports fishing lodge in Katmai National Park. I fell in Love with this wonderful state and moved here the very next year. I married an Alaskan man and had three beautiful children. These days I divide my time between Sarasota, Florida and Anchorage. Anchorage is a beautiful city with a backdrop of breathtaking Chugach mountain range and views of Cook Inlet and Turnagain Arm. The downtown area is my absolute favorite part of Anchorage. When this cottage, nestled in the trees, came up for sale I knew I had to have it! Built in 1941 and updated in 2011 it is the perfect place to relax after exploring all that Anchorage and other parts of Alaska have to offer. This is my first year renting the cottage and I am excited to share this wonderful place with visitors. Weeping Birch Cottage is quaint and comfortable. It is located very close to everything. You may enjoy walking down to ship creek to fish for King Salmon or perhaps just watch as someone lands one of the magnificent fish. The Saturday market ( which actually takes place all weekend...not just on Saturday's) is a great place to buy giant Alaskan produce, shop for Alaskan made crafts or enjoy local foods. You will want to explore the unique downtown stores as they are an easy walk or short drive away. There is a portable air conditioner that coo,s the entire cottage during warm weather. There is one private parking spot just for you. There is street parking available for any additional vehicles. coffee maker and grinder available. Coffee, creamer and sugar as well as some spices and assorted pantry items available. This house is fully stocked with all kitchen essentials. You can make a huge Famiky meal here. A small relaxing yard with outdoor table and chairs and flower garden. There is a small chest freezer available to store any fish you caught or any frozen Alaskan treats you bought and want to take home. Nancy was so kind and welcoming! She really went above and beyond with little details to make it seem like your home away from home. Dealing with her was a pleasure, much appreciated and we will go there again upon our return. Thank you, Nancy! Laura B. Great location, very clean and comfortable. We had a great experience working with Nancy. She was very prompt with responses. 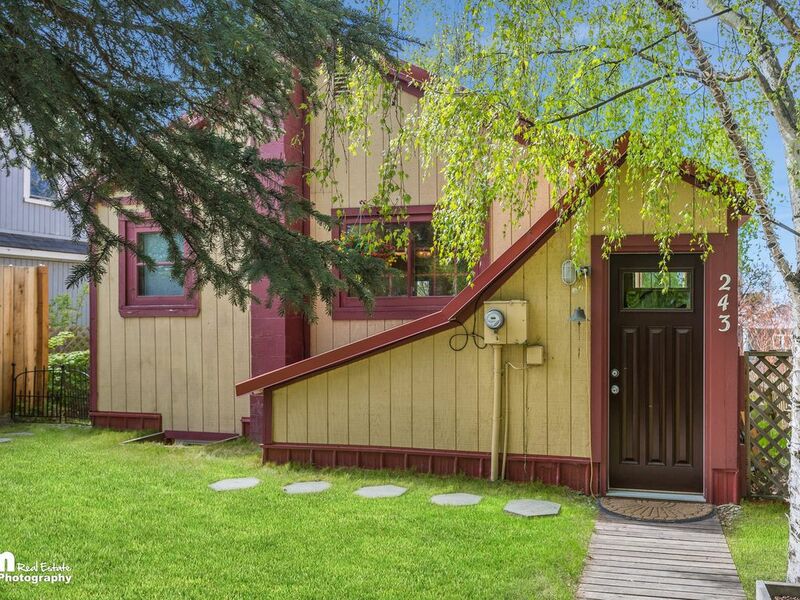 The cottage is close to town, Farmer's market and the Alaskan train station. The property was very clean and comfortable. I felt like a resident not just a guest on vacation in a hotel. We plan to return next year. What a time we had! We loved the cottage! It was small but perfect for us (2 + 1 child). It was very clean (very important for me!!) and I appreciated the attention to detail. It had everything you needed! We even got some surprise ice cream in the freezer from the host! We did not use the second bedroom located downstairs but this was additional space. The washer and dryer are practically new. The location is great, close to everything. The host was wonderful to communicate with, super responsive and worked with us and around our schedule. She even found us a pack and play for our son so that we do not have to rent one. Thank you and highly recommend. We would stay there again. My husband and I stayed for six nights. The cottage was comfortable, well stocked and we had room to spread out. All for roughly the same price as area hotels during tourist season. The location was great and we were able to walk downtown and nearby Tony Knowles coastal trail where we walked and took bike rides. The neighbors on either side of the cottage were friendly and welcoming. We ate out some of the time, but it was very nice to have a well equipped kitchen for breakfasts and the couple of dinners we made when we didn't feel like eating out. I found the bed (queen) to be very comfortable and I slept well. However, if you are a light sleeper you may want to bring earplugs since the cottage is located in a city with typical city noises. We were not bothered by any of it, however. Overall it was a nice place to stay while in Anchorage and Nancy could not be easier to work with! This is a great place to stay for a small family or couple. The kitchen was very large and well equipped with everything you need to make a good meal. The living room was nice with a comfy couch and chair to watch tv. Although the shower in the bathroom was a little tight, it was still nice and the towels and shampoo/soaps provided was a nice amenity. The bedroom was cozy and if you're used to sleeping in a king-sized bed, the queen bed will feel cramped to you and your mate. Having a washer and dryer in the basement is very nice. The location is excellent for going downtown to the restaurants and shops. All in all, this is a great place to stay...very quaint and tastefully decorated. Nancy provided a wonderful environment for a chemically sensitive person in the main part of the house. The house had a neutral smell about it. No cleaning chemical odors noticed on the main floor and the sheets and towels were without soap smells which was really appreciated. Nancy provided excellent customer service. The cottage is clean and well maintained and well stocked for cooking and coffee and tea were even supplied. The internet worked well and there was a nice TV if needed. Nancy has tried to provide everything that a guest would need. There are brochures and other reading materials about Alaska on the shelves. The cottage is not far from downtown and a short taxi ride to the bus station ($5.) I rented a car so don't know what the cost would be for a cab from the airport. The train station is close by as well as a small airport so you do hear trains and planes now and then but mostly it is a quiet neighborhood. Seemed safe to us and it did have pretty easy access to the freeway for heading north or south. The cottage was comfortable without the use of the heater or air conditioner at this time of year. The only thing we were surprised at was the 2nd bedroom is actually in the basement with the washer and dryer and it does have soap smells in this room and a covered over window. Fortunately I am not sensitive to soap smells nor adverse to sleeping in a closed in space so this space did work for us as an additional sleeping space. We did eat at La Cabana which is a block away and it was good Mexican food. I would recommend this property to friends but would advise them of the 2nd bedroom being in the basement. There is a visitors center located on the corner of 4th Avenue and F street, a short walk from weeping birch cottage. The visitors center has pamphlets as well as knowledgable individuals that can help you find fun things to do in Alaska. Perhaps a Fishing excursion, a trip to Denali national park, a train ride to Talkeetna or Seward or perhaps the location of the best pizza in town.